Think you drive a fast car? Win your chance to prove it, on the TRACK! tdott.me and BMWCC Trillium Chapter is building driver awareness and encouraging driver's to curb street-racing and promote skillful driver education in a safe and controlled environment. 'Take it to the track!' 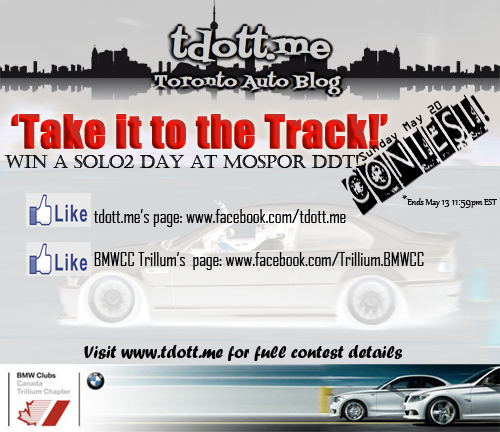 by giving away one (1) free entry to BMWCC's Solo 2 track event at Canadian Tire Motorsports Park – Driver Development Track (aka Mosport DDT) on Sunday May 20th, 2012. Share and encourage your friends to enter! First timers or advanced drivers, all makes, stock or modified cars, new or old are all welcomed! Experienced volunteers will be available to help you hone your skills on the track, don't be afraid if you've never done this before! This contest is open to anyone with a valid driver's license and a vehicle (all makes are welcomed!) they wish to bring to Canadian Tire Motorsports Park – Driver Development Track (aka Mosport DDT) on Sunday May 20th, 2012. A winner will be selected at random on May 14th and announced on our facebook page. Contest closes May 13th 11:59pm EST. All entries must be submitted prior to contest close to be entered in the winners draw. 1.1 Eligibility: The 'Win a day at Mosport DDT' 2012 Contest (the “Contest”) is open to all residents of Canada who has a valid Driver's License and vehicle that meets eligibility requirements for Solo2, except employees of tdott.me or BMWCC's board members. (“Contestants”). 1.3 Contest Entry: Upon completion and submission of the above, eligible Contestants will be entered into the Contest for one (1) chance to win the Prize. 1.4 Contest Entry Restrictions: Contestants are restricted to one (1) entry per person. Entries indicating the same name or facebook account will be considered, for purposes of the Contest, to belong to the same Contestant and therefore are subject to the above restriction. Any excess entries will be invalid for purposes of the Contest draw. 1.5 Awarding of Prize: The Prize will be awarded to a contestant that will be chosen at random, each contestant will be given a number and a random number generator will be used to select a winner. The winner will then be qualified to ensure they've met all eligibility requirements. Failure to comply will result in a disqualification and another winner will be selected. 2.1 Prize: There will be one (1) prize awarded Contest Period — 12:00 a.m., Eastern Time, April 20, 2012 to 11:59 p.m., Eastern Time, May 13, 2012. The Prize consists of one (1) admission to BMWCC's Solo2 Event on May 20th, 2012 (“Prize”). There will be a random draw for the prize. Prize must be accepted as awarded. No cash alternatives, substitution or transfers of the Prize will be allowed. The winner will be contacted after the contest is closed for details required to register for the event. 2.3 Prize Draw: The Prize (1 in total) will be awarded by a random computer generated number (one draw per Contest) from all eligible Contest entries received during the applicable Contest Period. 2.4 Notification of Selection: The selected Contestant will be contacted via facebook or email (using the contact information provided on the facebook profile used to enter the Contest) at least three (3) times within four (4) days after the Draw. If the selected Contestant cannot be contacted in that time, another Contestant will be randomly selected and the initially selected Contestant will be disqualified and will have no recourse towards tdott.me & BMWCC or anyone involved in the Contest. No substitution for, or transfer of the Prize, will be allowed. Rules are subject to change at any time. Goodluck to everyone who enters! Keep those contest entries coming! Don't forget to post a picture and share with your friends!